Firstly, with roll forming technologies developing. 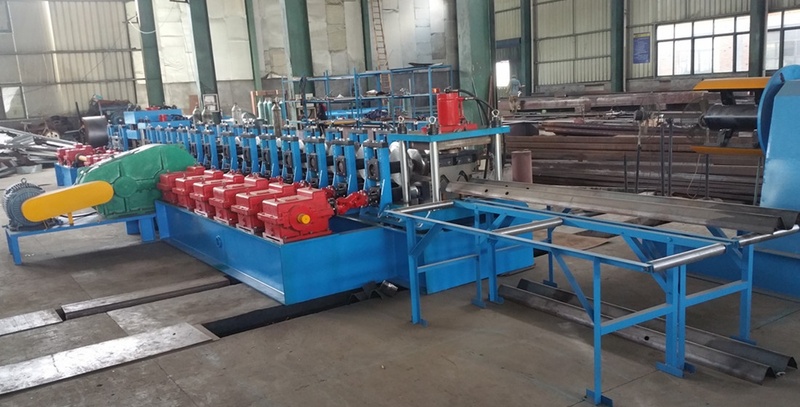 w beam guard rail roll forming machine is for producing guard rails with holes punched from galvanized steel of 482mm width and 2–4mm thickness. Also, there are different transmission systems optional for a highway guardrail roll forming machine in the market. An economical guardrail machine usually applies chain-sprokets transmission system! This kind of transmission system is only for the production of 2mm-thick crash barriers. On the other hand, Gear-boxes plus universal joint-shafts transmission system is for standard guard rail roll former for thickness from 2–4mm. Last but not the least, different roll forming structures are optional for different w beam guard rail roll forming machine. For example, Integrated forming stands deals with materials thickness from 2–3mm, while Separate forming stands deals with materials thickness from 2–4mm. Our artical regarding roll forming stands structures may help you in this matter. And no the Iron Cast Roll Forming Stands is widely used for Guardrail Roll Forming Machine, which is very stronger. Believe Industry Company have several different designs of w beam guard rail roll forming machine. Contact us for more details.